Influencer marketing has been a hot topic for marketers the past several years, and because it is still a fairly new concept, it has left many scratching their heads. Because influencer marketing is different from traditional advertising, and there aren’t clear industry-wide guidelines or guaranteed results, it isn’t surprising that some marketers have been reluctant to begin using this tactic. Given that influencer marketing has been massively successful for many brands, both big and small, and that many in the industry are eager to learn more, we invited three successful influencers for a panel discussion to our February 5th luncheon. The panelists, who each have their own content style, platforms, and business approach, discussed many different aspects of influencer marketing, including tips for marketers who want to add this trendy tactic to their overall marketing plan. To start, we asked the question that was undoubtedly on several people’s mind: “What exactly is influencer marketing, and how does it work?” In so many words, the agreed upon answer was that influencer marketing is simply leveraging someone else’s influence that they have over an audience, large or small, to further a brand’s awareness. And often, this is done through social media platforms. Have a plan when reaching out to an influencer. Make sure to do your research and ensure that your selected influencer’s audience aligns with yours. Before you reach out it is important to consider a budget, as you would never go into any other aspect of business without a set budget in mind. You should then consider what type of content you hope will be created out of the collaboration, and then, finally, decide on a clear call to action that you would like people to follow. Any business or brand can leverage influencer marketing. When it comes to influencer marketing, most people think of beauty, hospitality, or retail brands, as they are the most common in this space, however, there are opportunities for a multitude of industries and brand types. Find someone who has influence over your audience, or who communicates with your desired customers, and leverage that relationship. Look beyond follower count. While a follower count is an easy vanity number to use to measure the value of an influencer, it can be misleading, and not all encompassing of their true reach. As sad as it is, there are influencers who will purchase fake followers, so it is important to look at engagement rates on their content. Are real people liking their photos, sharing their content, or commenting and tagging friends? These are important metrics to take note of. There’s more to life than Instagram. Everyone loves Instagram, and that is typically a marketers first stop when researching a potential influencer, but it is important to remember that other platforms, like a website or different social media platforms, can have just as big of an impact on specific audiences. Liz Della Croce explained that her Instagram, where she has over 30,000 followers, only accounts for 2% of her business, and that her website is her true money maker. Remember, Instagram is just one social media channel. Remain authentic. With 20% of consumers reporting that they have unfollowed a brand on social media because they thought the content was too corporate of not authentic, it is vital that influencers remain true to their brand. Finding an influencer who aligns well with your brand, and that can create an authentic message on your behalf that will resonate with their audience is key. If an influencer turns you down for a collaboration, don’t be disappointed, it is probably a good sign if they are picky with what they say yes to. Don’t limit an influencer with a tight contract, as 40% of influencers believe that overly restrictive contract guidelines are one of the biggest mistakes brands and agencies can make when working with them. Trust the influencer to create content that they know will work, because, after all, who knows their audience better than they do? Long-term relationships can be more beneficial. Influencers talking about your brand more than once will get their audience’s attention. There is no set industry price for influencer marketing. Prices will vary from influencer to influencer and contracts often take negotiation. Measuring success is not black and white. Influencer marketing campaigns don’t always end with perfect numbers entered into an Excel spreadsheet that prove success. Long-term influence for a brand is difficult to measure, but is something that is clearly working for many. 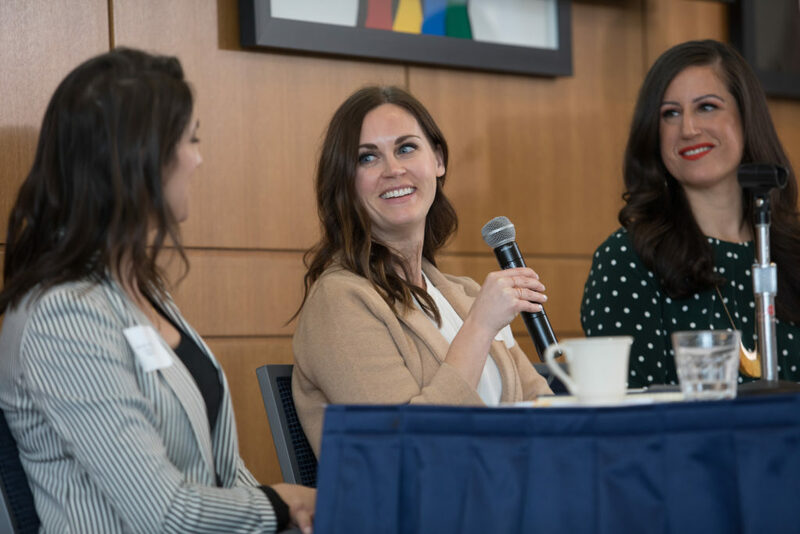 Liz, Jill, and Emily gave great insight into the complicated and ever-changing world of influencer marketing, and, because of their help, we are looking forward to seeing some of the great influencer campaigns that our members execute in the future. Looking for more? Great news! Our panelists agreed to a live recording of the luncheon’s discussion. Tune in now to Marketers in Motion: Episode 5 and find some more notable influencer marketing stats in the show notes.